Sherry FitzGerald welcomes to the market this charming residence set on 0.76 acre of mature gardens located in Galway’s most sought after address, lower Taylor’s Hill, which is for sale by public auction. The auction will take place on November 9 at 3pm in The Ardilaun hotel, Taylor’s Hill. The advised market value is €1,350,000. 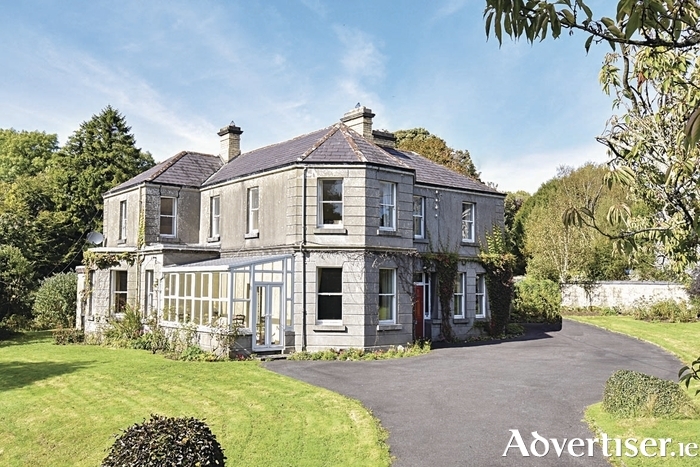 Cluain Mhuire is a substantial detached residence built circa 1913 and standing on a site of approximately 0.76 acre of very established gardens. The house stands centrally in the mature gardens. The Church of Ireland originally built the property as a rector’s residence and held it until 1961 when the current owners purchased the property. Over the intervening 56 years it has acted as a home to a large family who have, with care and love, maintained and further developed the property. They feel it is now time to pass the home on for the next stage of its history. The residence is a handsome two storey bay windowed property extending to 348sq m, retaining its original features of large well-proportioned bright rooms, high ceilings, original feature fireplaces, and pockets of charm at all levels. While having been well maintained and cared for it will benefit from modernisation and upgrading of facilities. The property is listed as a protected structure under the current Galway City Development Plan 2017-2021. A tree lined avenue leads to the open expanse of gardens that surround the residence, offering maturity, shelter, and privacy. Established trees intersperse the site, hedgerow boundaries, orchard, fruit garden, enclosed yard, and outhouses. The vendors of Cluain Mhuire have enjoyed 56 very happy years there and have developed the gardens, planting trees, shrubs, and fruit gardens to create an oasis of calm in the heart of Galway. It is with a heavy heart that they have decided to downsize but they are hopeful that the new owners will also enjoy this very special place. Situated at the city end or bottom of lower Taylor’s Hill, Cluain Mhuire is very conveniently located within 15 minutes' walk of the city centre, NUIG and UHG, and Salthill Promenade. There is a host of leading schools, both primary and second level, within minutes, as are shops and sports amenities.